If you want to avoid having to pay out more later it’s important that you get your groundworks and foundations right from the start. If you don’t, then you risk needing to pay for concrete to fill in extra trenches. Though you may be happy with your initial steps, it doesn’t necessarily mean that your local planning authority will feel the same. They will be looking to see if your home is being built in the location indicated by the approved plans. If the dimensions of the property aren’t specific, drawings can be scaled off by planning enforcement officers to determine that your home is going to be built in the correct position. A major reason for this is that the impact on neighbouring buildings has to be considered – in terms of whether or not they will be overlooked or affected by overshading. Consequently, distances to boundaries and levels need to meet the relevant criteria. Only you and your builder will be undertaking the task of the setting out at the beginning, so it’s important to go through the process carefully to make sure that there are no errors. The first thing to do is to place pegs in the corners, and then mark the area between the pegs with sprayed chalk lines. Once this has been done you can begin to dig the foundation trenches. For reasons of clarity, the centre line of the foundations should also be marked. While, after the foundations have been concreted, pegs will be used with string lines to establish the wall positions. There are two popular ways that foundations can be created, namely trench fill foundations and strip foundations. Trench fill foundations are often the preferred choice of self-builders, together with operators who work on a big scale. The trench fill method means that no bricklaying underground is required. It’s also a method that can save time, with concrete poured up to 150mm from the surface of the ground. It should be noted, however, that a trench fill foundation is only suitable for a ground that is stable. For instance, the sides of the trench have to be solid enough to bear loads. Clay and chalky soil are the type of soils best suited for laying a trench fill foundation. Though normally wider than a trench fill foundation, strip foundations are thinner with less concrete being used. A thickness of 300mm will usually be required for a strip foundation. The walls masonry courses to the damp-proof course will dictate as to how thick the walls will be. For a site that slopes, it will be necessary to step the foundations so that they are level. Steps must be overlapping, and, at a minimum, should be as wide as the trench after it has been concreted. This will involve shuttering across them. It’s advisable to use plywood and retaining pegs for this purpose. Sandy soils, and softer soils generally, will often only be suitable for strip foundations. Your building control officer will need to be informed at various stages during the building process. This is because inspections have to be carried to see that the work is in order. Inspections will also need to be carried out by your insurance warranty inspector. 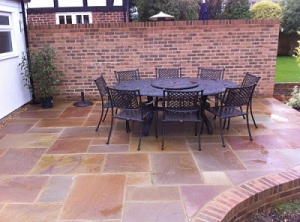 UK Surfacings are specialists in groundworks and foundations for commercial, domestic and industrial customers. We have a wealth of experience and are committed to bringing you the highest quality results at excellent prices. For more information, get in touch with us today.